I went to the dresser and took up the watch, with the face still down. I tapped the crystal on the corner of the dresser and caught the fragments of glass in my hand and put them into the ashtray and twisted the hands off and put them in the tray. The watch ticked on. I turned the face up, the blank dial with the little wheels clicking and clicking behind it, not knowing any better. Jesus walking on Galilee and Washington not telling lies… There was a red smear on the dial. When I saw it my thumb began to smart. 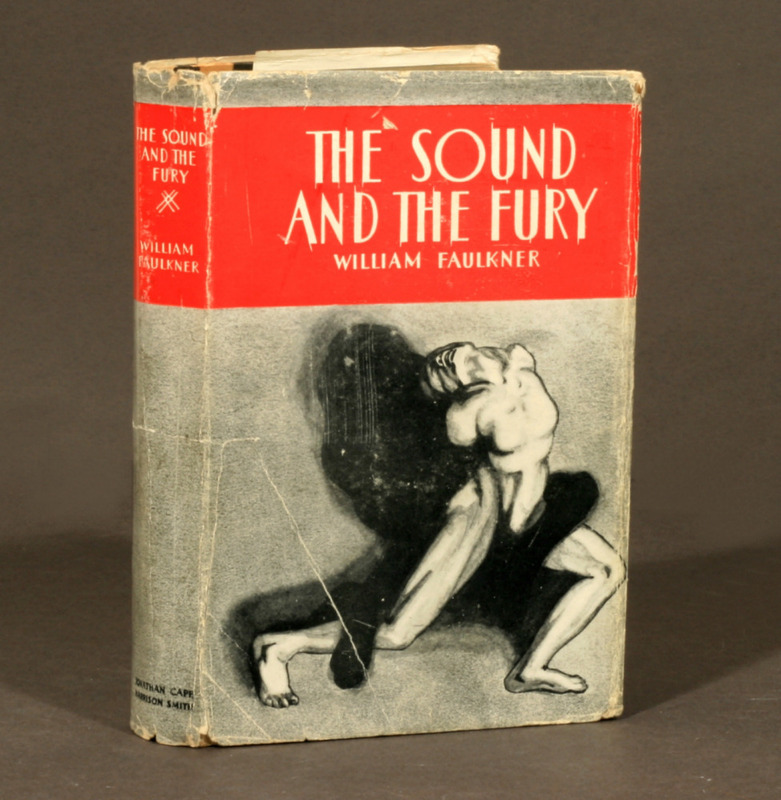 So begins the nineteenth birthday of Quentin Compson, a doomed character of Faulkner’s Sound and the Fury who cannot abide time, cannot dwell in it because he sees its folly and despair. While Faulkner’s other chapters occur on Good Friday, Holy Saturday, and Easter Sunday, Quentin’s is set on June second, his own brithday, designating his character’s independence of sacred time; the continual clicking is all he has. And Quentin cannot stand it – his demand for a perfect, Edenic world is epitomized in his fetishization of his sister Caddie’s virginity, which for him is a dead and isolated memory, something belonging to a past without remainder which time has moved beyond though Quentin, for his part, cannot. In his mind, he has an embalmed portrait of a perfect past (which was never perfect) which the tickings of the watch have eroded; the tension between time’s forward movement and his own rigid nostalgia drives him to break the clock (which even then cannot stop ticking) and eventually to abdicate from time altogether, on a high bridge in Cambridge, Massachusetts. Quentin and his brothers fail to deal with time in different ways, and Faulkner’s one vision of hope is “the recollection and the blood of the Lamb.” The implicit suggestion that the blood of the Lamb is experientially realized in recollection is a compelling one this time of year, the time the Church has designated for rememberance, recollection. ‘How does the past relate meaningfully to the present?’, Faulkner seems to be asking. And we all face Quentin’s problem in some way – the pure world of an old story of the birth of God, his obedience and suffering and death and resurrection, changes the world forever… and yet things are the same. Time stretches on, increasing every second the historical distance between Christ’s birth and our world, ‘red in tooth and claw’, and a Second Coming is continually deferred, pushed away, with only the recollective balm of written accounts, warm emotions, ritual gestures, and a liturgical calendar to ease the strain of time as it continually threatens to pull away from the stories which claim to give us meaning. All that to say, there is a gap between the events themselves and our memories of them, only mediated by words on a page or vague images. Just try to picture, with unaided memory, your child’s face at age five or the home in which you lived growing up – and those are experiences in which we have lived for days or years; appropriating events over two thousand years ago, of which we have no memory, is incomparably difficult. Undoubtedly what is thus palpitating in the depths of my being must be the image, the visual memory which, being linked to taste, has tried to follow it into my conscious mind. But its struggles are too far off, too much confused; scarcely can I perceive the colourless reflection in which are blended the uncapturable whirling medley of radiant hues, and I cannot distinguish its form, cannot invite it, as the one possible interpreter, to translate to me the evidence of its contemporary, its inseparable paramour, the taste of cake soaked in tea; cannot ask it to inform me what special circumstance is in question, of what period of my past life. Will it ultimately reach the clear surface of my consciousness, this memory, this old, dead moment which the magnetism of an identical moment has travelled so far to importune, to disturb, to raise up again out of the very depths of my being? I cannot tell. Now that I feel nothing, it has stopped, perhaps gone down again into its darkness, from which who can say if it will ever rise? Ten times over I must essay the task, must lean down over the abyss. And each time the natural laziness which deters us from every difficult enterprise, every work of importance, has urged me to leave the thing alone, to drink my tea and to think merely of the worries of to-day and of my hopes for to-morrow, which let themselves be poured over without distress of mind. This section is absolutely saturated with Eucharistic imagery. But Proust’s variation on the Christian Eucharist truthfully admits the idea that the sign may fail to point to its meaning; the link between symbol and symbolized, sacramentum and res, can unravel. “I cannot distinguish its form, cannot invite it” – this is almost a manifesto for a theology of the cross as it applies to memory. 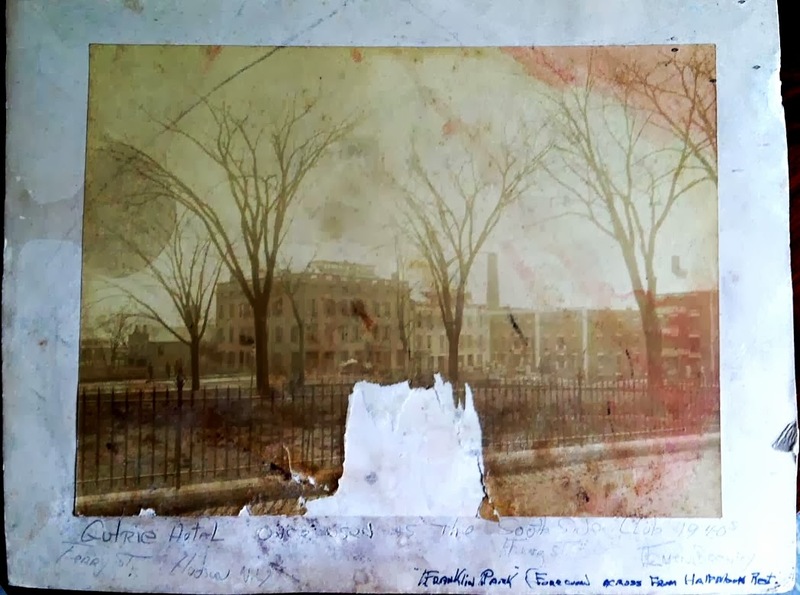 The form of death, resurrection, incarnation cannot be invited in memory; we resist placing ourselves in time, implicitly favoring, like Quentin and Proust’s narrator, an eternal present, “worries of to-day” and “hopes for to-morrow.” (The song “MacArthur Park” also uses the image of a quasi-Eucharistic cake to denote a breakdown in memory, though perhaps less artfully). As the narrator recalls his childhood, he remembers that due to his ‘nervous condition’, his only happy moment of the day was when his mother kissed him good-night. For him, all the meaning and intelligibility and raison of the world was compressed into that one lapidary moment; reality was formed and instantiated for him only by that encounter. At the risk of being a bit Freudian in the reading, it seems the narrator always had a problem with the past, a fixation on that primal identity between mother and child, broken at the moment of birth; and since he cannot make do with recollection, he must have that unity re-instanced anew every night, on and on without satisfaction or end. We can almost hear Quentin’s clock ticking away: repetition of time without variation, movement without direction, ‘end’-less (telos) compulsion. We can also almost hear the melancholy repetition of Handel’s first half of his overture, as if the bare repetition of immanence is awaiting the irruption of God. And suddenly, when the created human being was placed in Paradise [Eden], there was with the angel guardian a multitude, i.e. a great wonder in the heavenly host, praising God on account of the human being, because the divine works shone out in him and because rationality was active within him; for an angel is rational only in praising, whereas a human being is rational in both praise and action. The great multitude of the heavenly host was praising God, because the angels in seeing the human being came to know God more! That is, Christ as perfect man re-presents the original plan of creation and Adam’s intended perfection, his reflection of God in the image (and, by way of anticipation, the image perfected by virtue in the future). That is, the natural order of the world – and the human’s image – can remind us of redemption, point to God in the here-and-now. But Hildegard’s first (of two) Christmas homilies remains incomplete, precisely because we live after the Fall now, and the image has been covered-over/defaced/occluded. To fetishize a perfection of the human person is to reject the Fall and therefore time, to reprise the error of Quentin in his inability to detach from his own Eden – the South before the war, the mythical purity of Caddie. Which is why humanity may be seen in Jesus; not Jesus in humanity. But still we have no way to appropriate the Christmas story, again apart from the vague words and images which reverberate unreliably. 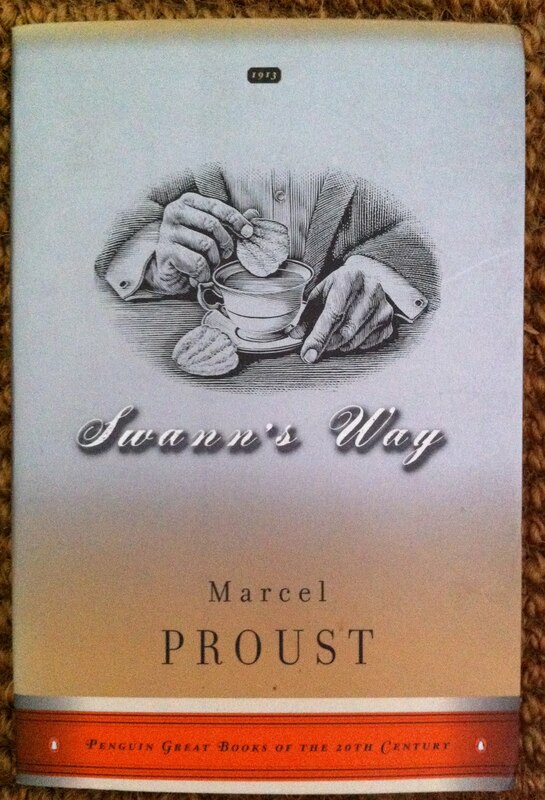 Again, recalling Proust, the past cannot be invited, and realizing our inability to recapture Eden recollectively is the starting-point which Quentin misses; living outside of the novel’s setting in Good Friday/Holy Saturday/Easter Sunday, his understanding of the past cannot be resurrected because, in a sense, he does not allow it to be crucified. The starting-point is the inability to recall, the inability to escape the ticking of the present – the pocket-watch must be worn, in other words, and endured rather than destroyed. And suddenly the memory returns… when from a long-distant past nothing subsists, after the people are dead, after the things are broken and scattered, still, alone, more fragile, but with more vitality, more unsubstantial, more persistent, more faithful, the smell and taste of things remain poised a long time, like souls, ready to remind us, waiting and hoping for their moment, amid the ruins of all the rest; and bear unfaltering, in the tiny and almost impalpable drop of their essence, the vast structure of recollection. Christ’s incarnation tethers his story and experience to the human story and experience; theologically, it takes the entire structure of human experience and tethers it to an act of grace; the meaning borne by Proust’s cookie is tied into human nature itself, and now – expressed in the outpouring of the Spirit – all experience is intelligible as something with the potential to impart “the vast structure of recollection” – recollection of the story of Christ (‘belief’) and simultaneously the failings and limitations and fallenness of man (‘repentance’). As Philipp Melanchthon said, “anything by which the human heart recognizes the mercy of God is therefore a word of life”, something that may bear, albeit unpredictably, a sacramental structure of recollection. And so imagination/memory of self and God is combined in the person of Christ; the incarnational statement that he is fully God and fully man springs out of the categories of metaphysics and dogma and directly into the divine economy of salvation, salvation via self-contemplation and God-contemplation, which are joined and conditioned in Christ. And yet this truth of God entering into the world, and thus everything potentially communicating Proust’s ‘vast structure’, remains a distressingly theoretical statement, and we’re left not with a technique for properly re-collecting Christ’s life, but rather an affirmation of the story’s possibility to impress itself upon us. The structure of human dependency and need for rescue remains even for memory and belief, albeit amidst the potential for flashes of illumination with bread and wine, a verse of scripture, or any of the mundane experiences of life. 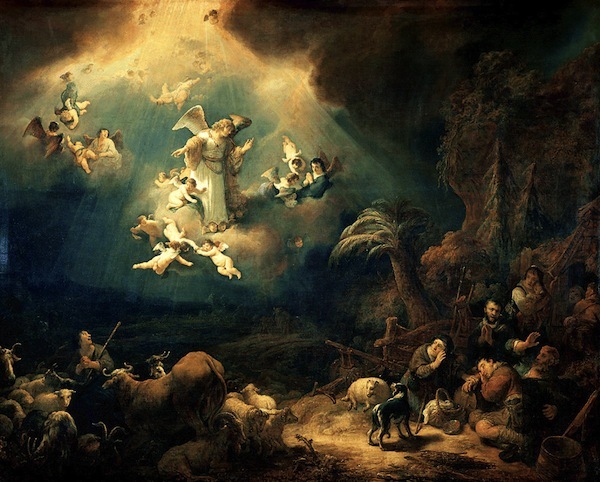 And suddenly, for it will be quickly, there was with the angel, i.e. with the grace of God, a multitude of the heavenly army, i.e. a multitude of virtues, praising God with the sweetest sound and saying: ‘Glory to God in the highest‘, i.e. in the knowledge of men, for God is able to make all things and lead the sinner back to life. ‘And on earth peace to men of good will‘, because God has returned to the earth to deal with the adverse troubles of the vanities, so that people may have the peace and quiet of good will when they do good things freely and are not prevented by weakness. And God will be the peacemaker among human beings.